Original sound design, widely varying instrumentation, broad thematic scope, and a dark, profound vision are the hallmarks of Palancar's classic 2003 release, Momerath. Originally released commercially on Blue Water Records, this album is now re-released and available freely under Creative Commons via Earth Mantra. Greg Bear is one of Palancar's favorite authors, and his novel Anvil of Stars left such an impact on him that this two-disc album is Palancar's tribute to this spectacular novel, essentially an unofficial book soundtrack. A collection of very diverse instrumental pieces, the release is an exploration of dark ambience, twisted abtract textures, progressive electronica, polyrhythmic post-rock, and exotic world fusion, with more than two hours of music. This music is intended to strongly echo the themes of the book, covering the extremes of human experience: from alien indifference all the way to unrestrainable emotion, from pure undiluted rage to delicate and fragile love, from the connections of family and community all the way to revenge and bloodlust, from images of unearthly beauty to impressions of the most horrifying warfare imaginable. Like the novel itself, Momerath is meant to be something that will hopefully tease your senses, inspire your emotions, shock your conscience, and perhaps even challenge your world view. For those who have not read Bear's book, it is very much a classical odyssey, following the tortuous path of his protagonists across a battle-scarred universe of distrust and suspicion, where the lawless and the law enforcer alike wield weapons of ultimate destruction. It is a study of the dark underbelly of the rule of law, and of the effect of revenge and hatred upon the human heart. This album aims to evoke at least some of the power and majesty of this incomparable piece of literature. 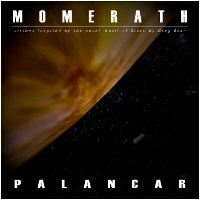 Whether or not you are a reader of Greg Bear, a reader of science fiction, or much of a reader at all, Palancar hopes the universal themes in Momerath will carry you away on a dizzying journey through the depths of the soul. Neat electro-ambient pieces. I'm kind of perplexed between my enjoyment of them, and the unfortunate conceptual associations that spawned them. Of course, even I had to de-program myself of such associations when I studied music. It is an interesting coincidence with this release, that I got the chance to read several of Greg Bear's novels this summer vacation, so I discovered him for the first time just several months ago. I knew other classic writers before (Asimov, Clarke, etc. ), but for some reason I never had the chance to read Bear's novels. Now I've read "Hegira", "Strength In Stones", "Beyond Heaven's River", "Tangents" and "Queen Of Angels", so listening to this wonderful release, I had an insight into the relationship between the music itself and the literature. Another great release from Earth Mantra. October 31, 2009 - The best! I'm writting this comment while I download Palcancar's last release and I'm sure I will enjoy every minute of it. Palancar music really creates an atmosphere and really takes your mind to other places. I particularly find it perfect for 'savasana' .